A mysterious fire threatens a boarding school. Heroic young people rescue the gruff and intimidating headmistress. There is a secret passageway. All this is in chapter one of an adventure story that combines classic literature with a modern mystery. Linus and Ophelia are teen-agers who have been left with their elderly aunt and uncle who own a bookstore while their scientist parents are on a tropical island carrying out their research. It is a miserably hot summer, the stuffy and academic narrator tells us. Bartholomew Inkster cannot tell this story without injecting bits of literary devices, Linus and Ophelia’s history along with background on the literary works they explore. Linus has discovered writings from an ancestor who tells how to bring literary characters to life. In this episode, they bring D’Artagnan and the evil Lady DeWinter to life while trying to solve a real life mystery of who wants to destroy their best friend Walter’s school. But D’Artagnan and Milady are more of a headache than a solution. And Bartholomew keeps putting in his two cents. Written with humor and a respect for the classics, Bartholomew manages to entertain and provide descriptions of literary devices. The story could be a way to develop a guide for writing. Because the voice is so strong – think a snarky Lemony Snicket – and the characters are so eccentric, this would make a good class read aloud for sixth graders. Even better let them read it to a book buddy as a literacy activity. The students could make several lists, any one of them would be a good reading worksheet: the literary devices, story details from The Three Musketeers, even the instructions on how to make literary characters come to life. There is a great book trailer for the first book in the series on the author’s website: http://llsamson.blogspot.com/. With the commercially-made book trailer as a model, students could make their own trailer for this installment. There is a lot of action, and the story problem is maintained throughout. Not everything seems logical, and the real life villain escapes. 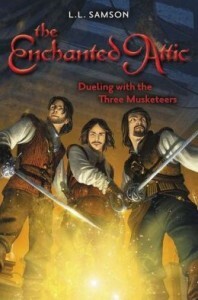 We never do meet the three Musketeers as promised on the cover. Still the adventure is a lot of fun.